Technological and societal trends have triggered a race to develop wearable exoskeletons that augment a user’s strength for a range of applications. In 1931 the American author Charles Fort (now best known for collecting details of weird and unexplained phenomena) coined the term ‘steam-engine time’. It refers to technologies for which the concept and underlying science has existed for some time, but that remain undeveloped until some triggering event, and then numerous teams, not in contact with each other, begin working on the technology at roughly the same time. The late 18th century was just the time to develop steam engines, Fort said, although the Ancient Egyptians, Greeks and Romans all understood the scientific basis of their operation and had tinkered with the principles; James Watt, Thomas Newcomen and Richard Trevithick all came up with their own versions. By Fort’s example, then, we can probably say that it’s exoskeleton time. The idea of exoskeletons has been around for decades. It’s a simple idea: use powered mechanics to increase the strength of a human operator. General Electric built the first one in 1965. It was a fearsome device called Hardiman, which used hydromechanical servos for power. Hardiman was supposed to enable a human operator to lift up to 1,500 pounds, but the prototype, capable of lifting 750 pounds, weighed twice that; and problems with the control system meant that it jerked so violently that it was never switched on with a person inside. But the realm of science fiction was where exoskeletons stayed for many years. No more, however. In the past five years or so, a plethora of research projects have been working on concepts for exoskeletons, and some working models have been developed. One such device, the BRA-Santos Dumont, developed by teams in the US, Germany, Switzerland and Brazil, helped Juliano Pinto kick the ceremonial first ball of the 2014 World Cup at its opening ceremony, despite his being paralysed from the waist down. At around the same time, the Rewalk Robotics exoskeleton, from Israeli firm Argo Medical Technologies, was approved for use by paraplegics outside hospitals in the US by the FDA; previously a ReWalk skeleton was used to complete the 2012 London Marathon (in 17 days) by Claire Lomas, who had been paralysed following a riding accident. So what’s tripped us over into ‘exoskeleton time’? According to robotics expert Rich Walker of the Shadow Robot Company, there are two triggers: one technological and the other societal. Walker referred back to popular culture to illustrate his point — Frank Miller’s graphic novel The Dark Knight Returns, which depicts the last days of Batman, shows the Caped Crusader’s alter ego Bruce Wayne developing powered armour to defeat Superman, who has become a government agent ordered to remove him. But the only way Wayne can power the suit is to hijack the city’s electricity grid by wiring it up to a lamp-post. ‘It doesn’t matter how good your exoskeleton is if you’re tethered to the spot, even if you’re Batman,’ he said. Iron Man’s suit is powered by a miniaturised ‘arc reactor’ — although nobody’s ever explained what that is — but the real world needs real technologies. ‘The energy density of the new generation of batteries designed for laptops, mobile phones and even electric cars means that considerable energy storage is now available in a form that is practical to make portable,’ Walker said. Indeed, ReWalk’s battery and computer, housed in a backpack, weighs 2.3kg of the system’s total 23.3kg. In general, exoskeletons are being developed for two applications: medical and industrial. In each of these, though, there are shades of usage that have a significant effect on what technologies are used in the design and how they are intended to operate. For example, there are two ways a medical exoskeleton can be used. It can help people without the use of their limbs to perform tasks they would otherwise find impossible, with the force provided by electric motors or hydraulic systems effectively replacing that exerted by the contractions of muscle fibres in non-paralysed people; such as with the use of a ReWalk device to complete a marathon. But it can also be used as a rehabilitation system to help people recover the ability to move their own limbs after spinal injury, nerve damage, stroke or other forms of injury. In this case, the exoskeleton takes the place or supports the work of a clinician using so-called ‘passive physiotherapy’ where the patient’s limbs are repeatedly moved into positions that they would not otherwise be able to achieve, which over time can help to restore the range of movement. The distinctions are less marked for industrial exoskeletons, although again there are some, depending on whether the system is intended to support workers performing repetitive tasks and prevent injury, or to help them achieve feats they simply would not be able to manage through muscle power alone. One project firmly in the rehabilitation camp is LOPES, a lower-body exoskeleton developed at the University of Twente in the Netherlands. 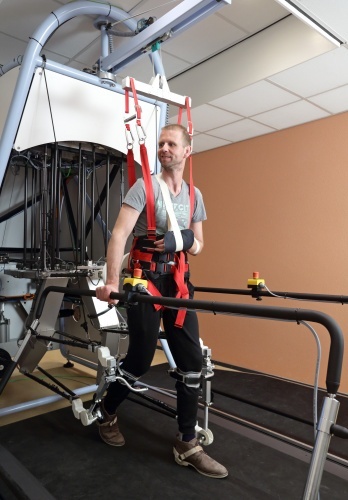 A tethered system designed to work with a treadmill, LOPES is now on its second iteration, LOPES II, which earlier this year made the transition from lab to clinic with the installation of systems at the Roessingh and Sint Maartensklinieks rehab centres, both of which were involved in the development of the system along with mechatronics companies Moog and Demcon. ’Passive physio is very demanding for the therapist because it involves manipulating limbs and bearing their weight; LOPES handles that, and also ensures that patients repeat the optimal range of movement each time. There is some debate over whether or not exoskeletons count as robots, because the presence of a human within the system is a crucial part of their definition. What tips LOPES II into the robotics arena is the array of sensors fixed to the patient via the harness that holds them in the system and supports the hips and pelvis through exercises. This detects and measures the amount of force the patient’s muscles are able to exert, and activates the exoskeleton’s motors to assist them: but only according to the amount that they need help to complete the movement and retain balance without stumbling. Over time, as the patient regains strength, the assistive force reduces, until the patient is able to perform the movements without any help. The LOPES system uses a control technique known as virtual model control (VMC), which translates the physical interaction between patient and robot needed for therapy into a ‘virtual model’ such as a spring or damper that can push, pull or cushion the moving limb into the correct movement. The team is about to start working on LOPES III, which will add another set of movements — the rotation of foot and ankle. ‘If you watch someone walking, a lot of the movement is triggered by the back foot pushing off the ground, and that depends on ankle rotation,’ Meuleman said. Another European project tackling the industrial aspect of exoskeletons is Robo-Mate, a €4.5m project involving 12 partners from seven countries in the EC. This aims to develop an intelligent, manoeuvrable, wearable exoskeleton for manual handling work. This is distinct from military or rehabilitation applications, according to project leader Prof Hans-Wernher van de Venn of Zurich University of Applied Science, because military exoskeletons tend to be too heavy and rehab systems don’t provide the correct support for load-bearing lifting and handling needed in industry. The project is supported by automotive companies, including Indra, a French vehicle recycler; Compa, a Romanian component maker; and Fiat, which will test the device in its research centre and on the factory floor. Robo-Mate will be supported by a steel cable hanging from the ceiling, and will include manipulators with object recognition systems. Passive systems will protect the parts of the body that users are not directly using in their work, such as neck and lower back; while active systems will assist movement of ankles, knees, hips, shoulders, elbows and wrists. The suit will also include a helmet with a head-up display and incorporating noise reduction to protect hearing, and a camera in the chest — coincidentally, the same point as Iron Man’s arc reactor — for quality control. According to van de Venn, Robo-Mate will make industrial work safer for staff by letting them reduce the physical effort needed to manipulate heavy components, while also helping older employees continue to use their skills; it will also reduce the cost of treating injuries. In the US, meanwhile, one team is taking a strikingly different approach to exoskeletons. While others take some inspiration from nature’s exoskeletons — in insects and crustaceans — in making them out of rigid materials, Harvard’s biodesign labs has developed an exosuit made from soft materials — mainly fabrics — which can be worn beneath clothing. Team leader Conor Walsh is careful to always refer to the system as an exosuit, rather than a skeleton. 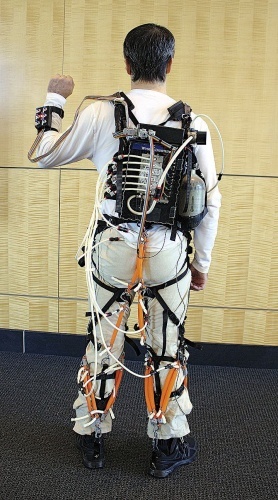 In its basic concept, the suit is a series of pulleys connected to motors. Using fabrics rather than solid materials prevents restriction of movement and allow the body’s natural movement to be used to generate force. Textiles, therefore, are at the heart of the exosuit’s function, and Walsh’s team is developing materials specifically to be able to apply a torque to the wearer’s body. The textile incorporates flexible sensors into its weave, which gauge the wearer’s movement and help the suit’s control system decide the best point to apply a force. These sensors include gyroscopes, pressure sensors and inertial measurement units, which incorporate accelerometers and are most commonly used in UAVs, aircraft, satellites and spacecraft. 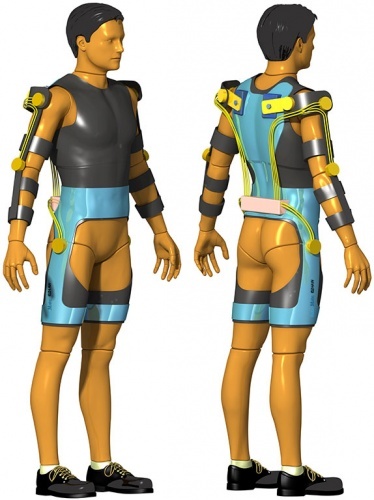 This is in contrast to rigid exoskeletons, which typically monitor joint angles. The team has also used surface electromyography to monitor muscle activity, which shows how hard muscles are working with and without assistance from the suit. The suit transfers forces through cable-driven electromechanical actuators, although the team has also tested pneumatic systems. These work by giving the wearer a ‘nudge’ at the most helpful point in the movement range, which is so slight that the wearer often doesn’t notice it. ‘People have felt their legs feel heavier when it’s not working, which is the best sign that it is working,’ Walsh said. said. A collaboration with sportswear manufacturer New Balance is aimed at developing the system for outdoor activities such as hiking, and Walsh’s team includes clothing designers. So an exoskeleton isn’t going to help you beat Superman, or take flight and battle aliens; but it might well help you to reach the summit of Mount Snowden or load up a removal lorry next time you move. My 19 yr old son was paralized nov 2013. Will this ever be available for him? How can he get involved in research? We live in alabama,we are going to sheppard center in feb 2015.
self-supporting, independently controlled robotic walking device. One other use that they could be used for, is resistance for building up muscles that are damaged or for athletes to train in to build muscles. This would be a great alternative to going to the gym!